(Seen at the afternoon performance on 27th February 2016). 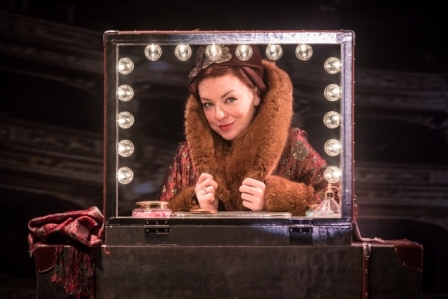 To get the obvious out of the way first, Sheridan Smith as singer, dancer, entertainer and personality lights up the tiny stage here and will dazzle when she reaches the Savoy. The most difficult songs a performer could be asked to make her own, she succeeds in, and how. Every line, word and syllable of “People,” “The Music That Makes Me Dance” and of course “Don’t Rain On My Parade,” are considered, weighed and delivered with unique meaning. Not songs to be wasted by a belt and “there you are, you heard it.” Instead, these are expressions and extensions of Ms Brice’s thoughts – “People” in particular with a deliciously deep undertow of meaning. If one were to note anything, it is simply when compared to her mother and friends (do NOT play cards with them, I was watching, it wasn’t pretty) Ms Smith is still working on her ‘yiddishkeit’ – that unique New York Jewish edge. While Gay Soper, Valda Aviks and Marilyn Cutts have it in spades, Sheridan is absorbing. Darius Campbell turns in his usual ultra-high quality “Matinee Idol” performance as Nick Arnstein, Fanny Brice’s love interest. A show-stopper in his own right, perfect casting. Also worthy of mention, Joel Montague’s “nice guy” Eddie Ryan is worth catching for versatility and surprising athleticism. As Ziegfeld, Bruce Montague is also firmly in control of his character, and did well hiring comedy duo Matthew Croke and Luke Fetherston, who make the most of a neat act 2 routine. For the younger ladies, Natasha J Barnes is a sympathetic Emma, while for the ensemble you’ll be hard pressed to find a leggier, frankly hotter, bunch of ladies on the London stage. Kelly Homewood, Emma Caffrey, Sammy Kelly, Leah Harris, Joelle Dyson and Rebecca Fennelly manage “en point” as well as an impressive range of other dance moves and nice character studies. It became easy to pick out the gossips, the romantics and the odd practical as the show progressed, thanks to some very satisfying background acting. Director Michael Mayer makes a slim story believable and keeps the show moving even where the gap between songs seems longer than expected. Michael Pavelka’s moving walkways are used inventively by choreographer Lynne Page, and Mathew Wright’s costumes with Mark Henderson’s lighting ensure everything sparkles in all the right places. The back projection is a terrific choice too, reminding us always of what looms largest in the life of this star. Simply, if you don’t already have a ticket booked, buy now before the transfer opens. I strongly suspect there won’t be much left once it has.